Enright Park: Community Meeting on the Future of the Park! 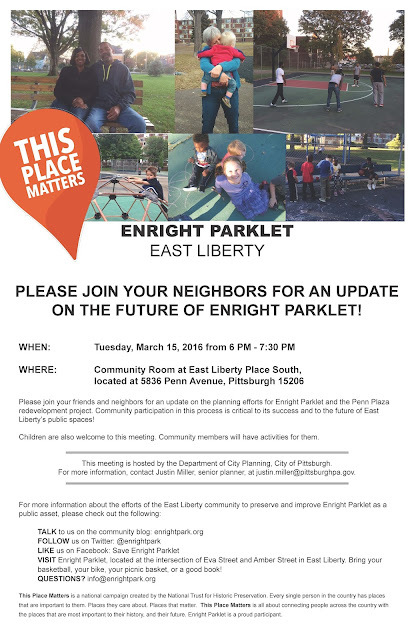 PLEASE JOIN YOUR NEIGHBORS FOR AN UPDATE ON THE FUTURE OF ENRIGHT PARKLET! Join your friends and neighbors for an update on the planning efforts for Enright Parklet and the Penn Plaza redevelopment project. Community participation in this process is critical to its success and to the future of East Liberty’s public spaces! Children are also welcome to this meeting. Community members will have activities for them. This meeting is hosted by the Department of City Planning, City of Pittsburgh. For more information, contact Justin Miller, senior planner, at justin.miller@pittsburghpa.gov. Download the poster and share with your neighbors here.